↑ "Mind over matter Stephen Hawking". Herald Scotland. http://www.heraldscotland.com/sport/spl/aberdeen/mind-over-matter-stephen-hawking-1.352226. ↑ "स्टीफ़न हॉकिंग की ग़ज़ब दास्तां". بیبیسی ہندی. 22 ستمبر 2013. http://www.bbc.co.uk/hindi/science/2013/09/130920_stephen_hawking_nn.shtml. Retrieved on 22 ستمبر 2013. سٹیفن ہاکنگ at the Internet Movie Database۔org/cgi-bin/ea.cgi? "Stephen Hawking at 70: Exclusive interview". 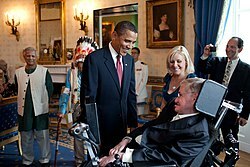 4 جنوری 2012. https://www.newscientist.com/article/mg21328460-500-stephen-hawking-at-70-exclusive-interview/.